When Pokemon Go launched, it started a massive trend in gaming. It was lauded for its supposed fitness benefits but the obsession of catching Pokemon seems to have gone a little far on the deep end. To say it’s a new obsession is saying very little. And these folks show how far some people would go to play Pokemon Go! Not even a something as important as a wife giving birth can stop one guy from trying to catch a pokemon. Lucky for him, he caught a Pidgey! Apparently, not all of them are willing to catch the Pokemon. Some would be content simply by having their photos taken with the Pokemon. To his defense, he already caught the same Pokemon, so it might’ve been a different story if it were a different type of Pokemon. A woman tweeted about a guy on commute with her who was so into the game of Pokemon that he asked his girlfriend to hold the train for him. Apparently, the girl wasn’t so into him, or his Pokemon-catching antics. So off she went with the train while the guy is left trying to catch his Pokemon! This one is wild – what are the chances that you’d stumble onto a dead body in search of a Pokemon? Well, that is what happened to a woman in Wind River who discovered a dead body while trying to catch a Pokemon. 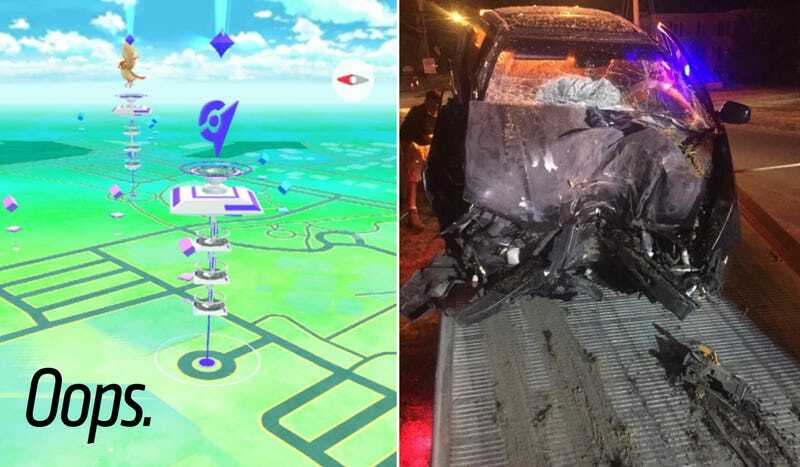 Oh, some people would go so far as to risk their own lives (and others) while trying to catch a Pokemon while driving. Not a good idea! Keep your hands and eyes on the wheels, please! When trying to find Pokemon, you simply won’t know what you will find. While one woman stumbles onto a dead body, another group of teens unknowingly walked into an armed robbery. You need to be extra careful about the Lure Module as others can manipulate it to attract you towards a particular location. It’s insane what type of madness people have created with Pokemon Go! How far would you go to catch one?